Join Pyramids Overlook Inn for a unique meditation retreat in Egypt. This program will offer an exceptional experience of calmness under the shadow of the Sphinx. In a tranquil space that Pyramids Overlook creates, you will feel the magic of the pyramids and the Great Sphinx. It’s an open invitation to unwind, unplug, and open your chakras. Be ready for the healing and the relaxing time. Each of the three rooms boasts stunning views of the Sphinx and pyramids complex, and the spacious, covered rooftop terrace is the perfect place to watch the evening laser-enhanced sound and light show while enjoying authentic Egyptian cuisine. This beautiful room is perfect for two to three people traveling together, with three single beds and views of the Great Sphinx and pyramids. This room has a queen bed which is perfect for two people. You're sure to enjoy the astonishing view of the pyramids and the Great Sphinx right out your window! This room has three single beds and is perfect for two to three people. Arrival and picking you up from Cairo Airport and then go to Pyramids Overlook Inn to have some rest. There will be sunset time for meditation in front of the pyramids and the Sphinx at the terrace, followed by chakras opening time. 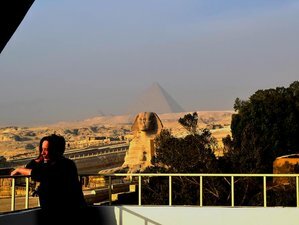 After a sunrise meditation session, you will have breakfast followed by a walking tour to the pyramids and the Sphinx. You will be back to the Inn just in time for a sunset meditation session. In the evening, there will be the time for the essential oil and massage treatment. Wake up and go for a sunrise meditation session. After breakfast, you will enjoy another massage treatment with organic essential oil. After that, you will have some relaxing time and enjoy sofi dance music. Included in the price of your retreat is a walking tour to the pyramids and the Sphinx. This retreat will be held at the Pyramids Overlook Inn. The inn offers the perfect resting spot for tourists interested in exploring the magic of Cairo. Located just steps away from the pyramids and the Great Sphinx on the Giza Plateau, it is an ideal starting point for a tour of Egypt's fascinating history and culture. During your stay in this retreat, you will be served daily breakfast and hot drinks. There will be a home-made dinner on your first night as well. During your free time, you can relax under the canopy while you commune with the Sphinx. In the evening, you can watch the sound and light show from the beautiful rooftop terrace. Enjoy conversation, a book, or a game of chess under the watchful eye of the Sphinx! The TV-free concept allows you a break from your everyday technological world. You can ask the inn’s staff to arrange you an outing for an added cost. You will enjoy two sessions of massage treatments with essential oil. The treatments are included in the retreat package. Please book your flight to arrive at Cairo International Airport (CAI). Transfer from and to the airport is included. Pyramids Overlook Innwill pick you up from the airport. Airport: Cairo International Airport Airport transfer included: Cairo International Airport No additional charges. You can request this in the next step. Pyramids Overlook Inn's mission is to create a calm oasis in the middle of Cairo - a tranquil space for you to feel the magic of the pyramids and Great Sphinx.